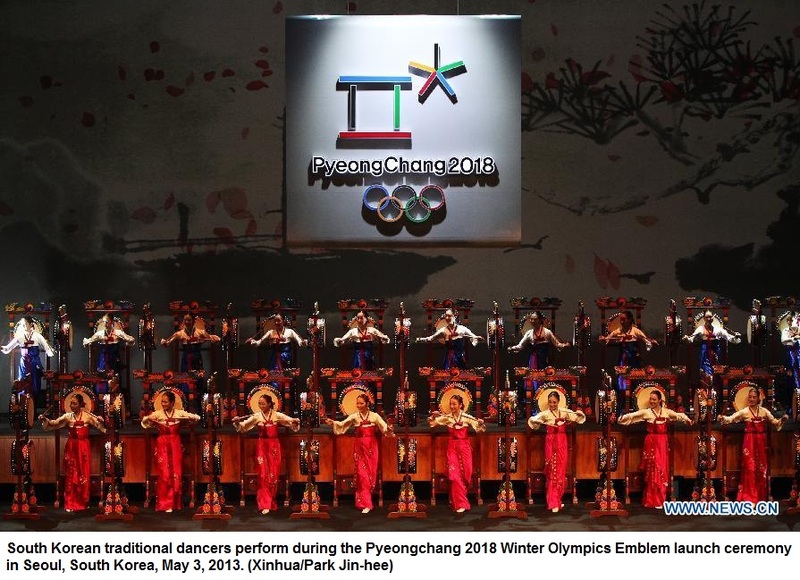 The Pyeongchang 2018 Winter Olympics Emblem launch ceremony was held in Seoul, South Korea, May 3, 2013. Pyeongchang will be the first city in Asia outside Japan to host the Winter Games. Japan held the games in Sapporo in 1972 and Nagano in 1998. SEOUL, South Korea – South Korean organizers say the 2018 Winter Olympics in Pyeongchang will help promote peace on the divided Korean peninsula. Kim Jin-sun, head of the local organizing committee, spoke Friday as tensions in Korea escalated to the highest levels in recent years. North Korea threatened to attack the U.S. and South Korea in protest of military drills and international sanctions against its nuclear test. Pyeongchang is located in Gangwon province, the only Korean province divided by the heavily fortified inter-Korean border. Kim says the Olympics will be a “symbol of peace” and facilitate dialogue between the two Koreas. He spoke at a ceremony to launch the new logo for the games, a five-colored square representing where the earth meets the sky. The design has its roots in the Korean alphabet. The competition venues of the PyeongChang 2018 Olympic Winter Games consist of snow venues (in Alpensia, Yongpyong, Jeongseon Jungbong, and Bokwang) and the ice venues (Gangneung). A total of 13 competition venues will be in operation. The snow sports will be held in 8 venues in Alpensia, Yongpyong, Jeongseon Jungbong and Bokwang. At the moment, there are 6 existing venues and 2 more will be constructed. 5 (1 existing venue and 4new venues) located in Gangneung will be used for ice sports. Four new venues: Speed Skating, Figure Skating & Short Track Speed Skating, Ice Hockey I, Ice Hockey II. The Albertville 1992 Olympic Winter Games was the last edition to be held in the same year as the Summer Games. The 1994 Olympic Winter Games staged in Lillehammer, Norway, was the first time the Winter and Summer Olympic Games were organised in separate years.